a new Terra Nova® introduction. has been protected by breeder rights in Europe and the USA. There are about 300 species in the genus Campanula. 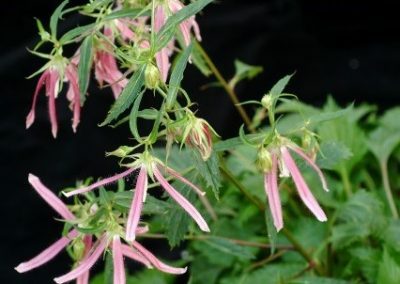 Campanula Pink Octopus® is a hybrid. Campanula is a diminutive of the new Latin word campãna which means ‘bell’ and that’s why the common name of Campanula is “bellflower”. It belongs to the Campanulaceae family. Campanula punctata(spotted bellflower), one of the parents, is a herbaceous flowering plant and is native to Siberia and Japan. 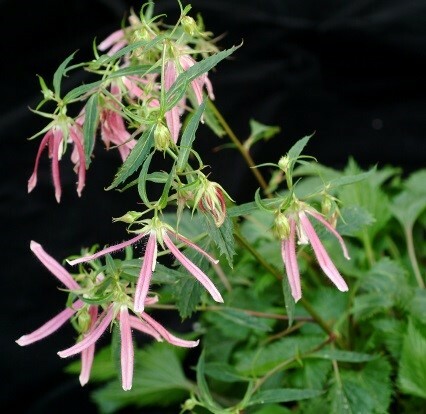 It is an ultra-hardy perennial plant which goes dormant in winter. It can grow in acid; neutral and alkaline soils. These perennials flower from June to August, with an occasional show in fall. The flowers are unusual as they have tubular, drooping, bell-shaped flowers that are cut like ribbons. The colors range from white to pale pink, having red spots inside the flower along with light hairs. It is a dioecious flower, meaning it has both male and female organs. The flowers and leaves are edible and have sweet taste. In Asia they are used as a medicinal herb. It is also a good plant to supply nectar for bees and hummingbirds. 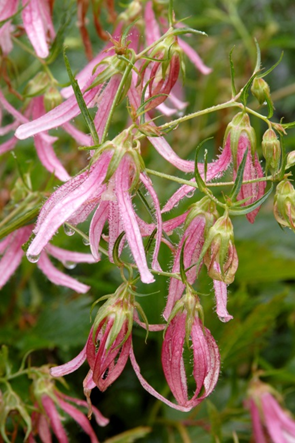 Campanula punctata ‘Pink Octopus’® is a Terra Nova® introduction with unusual flowers that resemble a Japanese lantern in bud and opens to bizarre, ribbon-like petals that re-curve slightly, like an octopus’ tentacles. 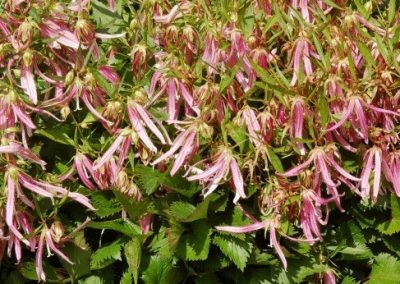 Campanula punctata ‘Pink Octopus’® features bold nodding pink, spider-like flowers with rose spots at the end of the stems. Over 50 blooms flutter down from the nicely upright flowering branches above strong, deeply cut thick foliage. These plants get better every year. A summer festival of flowers. It has proven to be heat; humidity and drought tolerant. The height is about 30cm and are recommended for green roofs as well, due to their strong and spreading root system. It carries US and European patents; PP18885 EU25441. 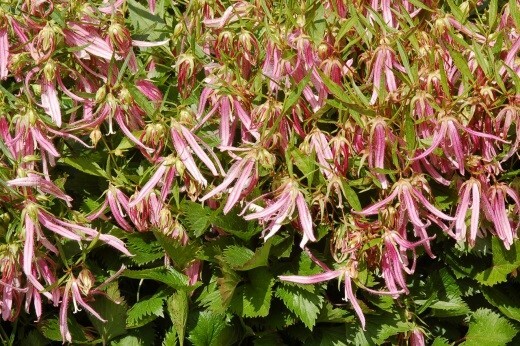 Campanula punctata ‘Pink Octopus’® is a hardy, easy and showy perennial. It will amaze and reward gardeners for giving so much pleasure without demanding much in return.